If someone asked me what is your favorite book, I would say Lipstick Traces: A Secret History of the Twentieth Century by Greil Marcus. Because while the book is often praised as beautiful or poetic, it is fundamentally a desperate and passionate call to murder. Because the book is different, a negation, a prank, and negation is always political. Because it is a statement of self-rule, of ultimate independence, of do-it-yourself “politics,” whatever that means, and, therefore, not nihilist. Because the book is an act that makes it self-evident that the world is not what it seems. Because at its heart there is a black hole, a willful lust for the destruction of values that no one is comfortable with anyway. Because the book damns the present and at the same time it damns the past with a curse so hard that it takes the future with it. Because the book shouts that it’s the future, your future, never sounding more like a criminal or an escaped mental patient. Because the book does not constitute a clash of generations, recognizing that youth, after all, is not a permanent condition, and that a clash of generations is not so fundamentally dangerous to the art of government as would be a clash between rulers and ruled. Because that seems to be what the book is after: a clash between rulers and ruled. Because the blinding intransigence of its music, so strong it makes intransigence into a self-justifying, all-encompassing new value, suggests demands no art of government could ever satisfy–and its intonation says there is no such thing as salvation. Because the book equates work with sin and rejects both. Because the book says that because God is perfect, and men and women are God’s creation, therefore men and women are perfect and cannot sin—except against their own perfect nature, by working, by surrendering their God-given autonomy to the rule of the “Great Ones,” to the lie that the world was made for anything other than one’s perfect pleasure. Because the book never learns the language of protest, legitimating power with the act of speaking, but claims the right not to protest, and not to work, and the right to ignore all the values that go with it: perseverance, ambition, piety, frugality, honesty, and hope, the past that God invented work to pay for, the future that work was meant to build. Because the book speaks in unknown tongues. Because the book will draw a laugh from the reader and then drive it back down the reader’s throat. Because what the book wants is obvious and almost impossible to comprehend. Because it wants to be delivered from this life and to be changed into a creature insignificant and despised. Because it wants to see nothing and to be seen by no one. Because it wants to destroy the world and to survive it. The book is quiet, steady, and the quiet lets you in: you can read it, and you can contemplate and question what you are reading, you can lie back and imagine what it would be like to want what the book wants. Because the book is an almost absolute negation, at the edge of nihilism, a demand to be next to nothing, and yet it is comforting. Because its peculiar mix of fatalism and desire, acceptance and rage turns up in unlikely places. Because the book happens upon the impulse of destruction coded in art, turns that impulse back upon art, and blows it up—there is nowhere to lie down and no time to contemplate anything. Because it seems to understand that the beautiful, the poetic, and the call to murder are all of a piece. Because the book aims to take all the rage, intelligence, and strength in its being and then fling them at the world, to make the world notice, to make the world doubt its most cherished and unexamined beliefs. Because the book aims to make the world pay for its crimes in the coin of nightmare, and then to end the world—symbolically, if no other way is open. Because for a moment it does. Because the book is a scam, a bid for success through scandal, a carefully constructed proof that the whole of received hegemonic propositions about the way the world is supposed to work comprises a fraud so complete and venal that it demands to be destroyed beyond the powers of memory to recall its existence. Because in those ashes anything would be possible, and permitted: the most profound love, the most casual crime. Because the book is a work of alchemy, an unacknowledged legacy of desire, resentment, and dread that has been boiled down, melted down, to yield a single act of public speech that will, for some, overturn what they have taken for granted, thought they wanted, decided to settle for. Because the book is, it turns out, a twisted story, less a matter of cultural genealogy, of tracing a line between pieces of a found story, than of making the story up. Because the book tries to follow this story, its gaps, and those moments when the story that has lost its voice somehow recovers it, and what happens then. Because the book is not so much an argument about the way the past makes the present as it is a way of suggesting that the entanglement of now and then is fundamentally a mystery. Because it truly does distill an old, forgotten social critique and brings that critique to life. Because it doesn’t tell itself. Because it stops looking at the past and starts listening to it, and because it seems to hear echoes of a new conversation: one that leads speakers and listeners unaware of each other’s existence to talk to each other. Because it seeks to maintain the ability to be surprised at how the conversation goes, and to communicate that sense of surprise to other people, because a life infused with surprise is better than a life that is not. Because the book attempts to make sense of cryptic pronouncements, mysteries blithely claiming all the weight of history. Because the book is a moment of real poetry that brings all the unsettled debts of history back into play. Because the book feels it is high time to put an end to the dead time that has dominated this century, and to finish the Christian era with the same stroke. Because the book is the best effort so far to get out of the twenty-first century. Because real mysteries cannot be solved, but they can be turned into better mysteries. 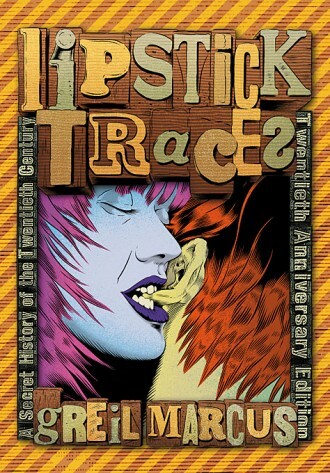 Lipstick Traces: A Secret History of the Twentieth Century, by Greil Marcus, is available from Harvard University Press.